I may have been quoted recently saying, "I find it hard to get excited about a salad if it doesn't involve cheese." Yeah ... I do love a good cheese. However, I definitely had to go to the mat with this salad, as I had a helluva time figuring out how to grill the halloumi without melting or burning it. 1. Leave the halloumi in the big brick you buy it in. Cutting it thinner or cubing it prior to grilling will result in a melty mess. 2. Freeze the halloumi before grilling. Again, this will help you avoid a melty mess. 3. Generously coat your halloumi with canola or another high smoke point oil prior to grilling. 4. Preheat the grill as hot as you can, (Rob refers to this technique as "burying the needle") and keep the halloumi on the grill only long enough to get nice, toasty grill marks. 5. Let the halloumi cool before you dice it for the salad, for cleaner cubes. 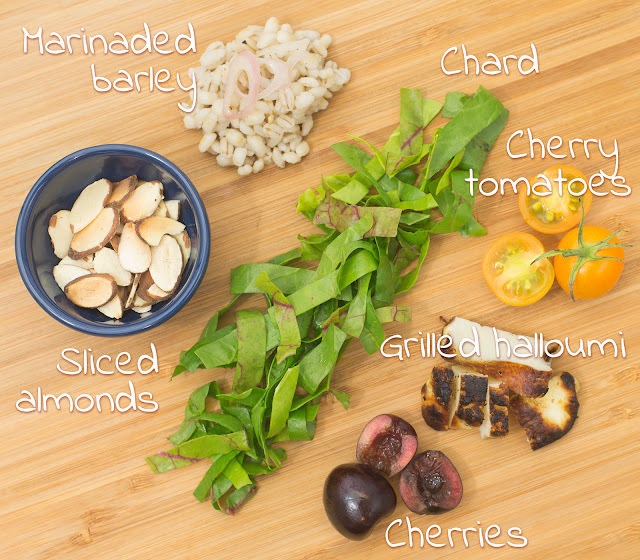 I hope you find these tips helpful, and this salad delicious! Make the marinaded barley: bring a small saucepan of water to a boil. Add the barley and simmer until tender, about 25 minutes. Drain, and toss with the shallot, olive oil, vinegar, and salt and pepper. Cool. Pack the salads: divide the barley evenly among 4 tall quart-sized containers. Layer in the halloumi, cherry tomatoes, cherries, and chard. Divide the almonds evenly between 4 2-oz jars or snack-size zip-top bags, one for each salad. Refrigerate until serving. Enjoy your salad: invert your salad onto a plate or into a bowl. Top with almonds. TIME-SAVING TIPS: Use pre-washed, bagged baby spinach in place of the chard. SPECIAL DIET SWAPS: This salad is vegetarian as-is. 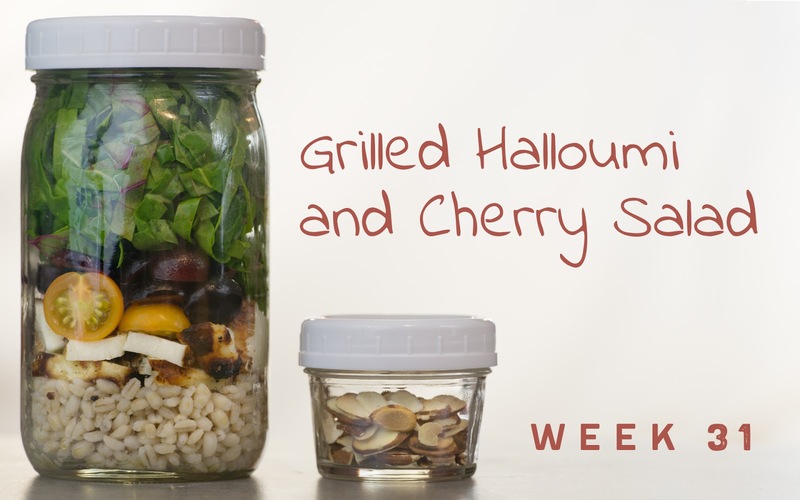 For a vegan salad, substitute grilled or broiled tofu for the grilled halloumi. For a gluten-free salad, substitute cooked, cooled quinoa for the barley. For a nut-free salad, substitute toasted sunflower seeds for the sliced almonds.